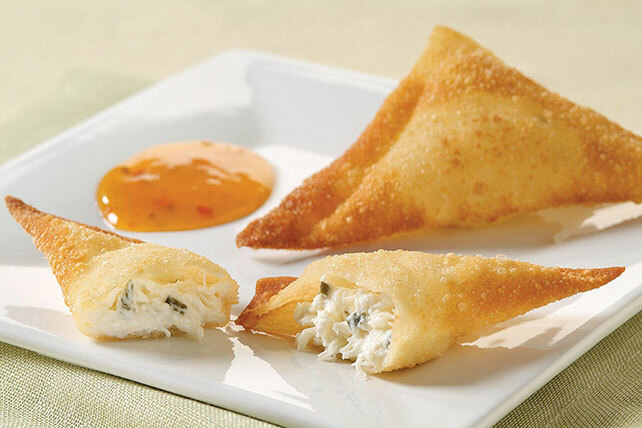 Make Crab Rangoon at home with cream cheese spread and a can of crabmeat! Crab Rangoon isn't too complicated, and you can skip the takeout with this recipe! Mix cream cheese spread and crabmeat; spoon onto won ton wrappers, adding about 1 tsp. crabmeat mixture to each. Moisten edges of wrappers with water; fold diagonally in half. Press edges together to seal. Heat oil in medium skillet or wok to 360°F. Add won tons, in batches; cook 1 to 2 min. or until golden brown on both sides, turning once. Remove from skillet with slotted spoon; drain on paper towels. Serve with sauce. Keep won ton wrappers covered with plastic wrap until ready to use. Wrap any remaining won ton wrappers tightly in plastic wrap and store in freezer.